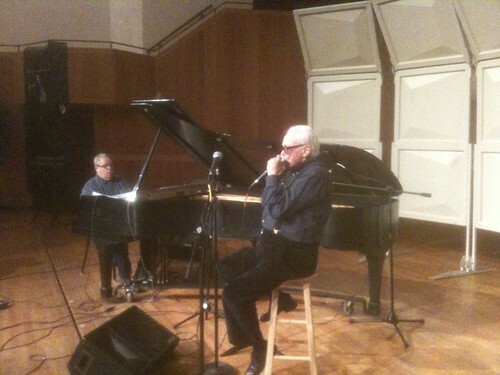 I remember the first time I heard a Toots Thielemans recording. I was visiting my friend Paul Weiler, who had broken his leg and was unable to get around for several months. He had a cassette playing in his boombox beside the bed. As it played, I heard the most unique musical sound I had ever experienced...a harmonica player burning up a bebop tune and playing stuff that Charlie "Bird" Parker might have played on alto sax. The next song on the tape featured the harmonica player playing a bluesy ballad that knocked my socks off. Of course, I was hearing Toots. 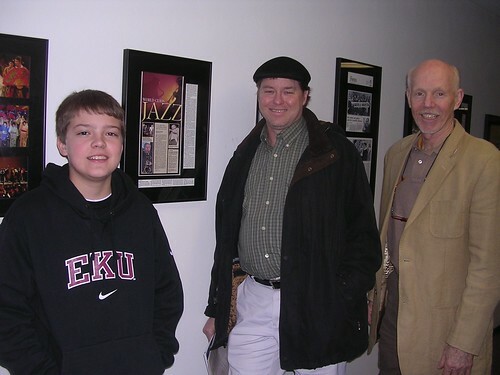 Toots and piano virtuoso Kenny Werner played today at the University of Louisville in the Margaret Comstock Concert Hall. 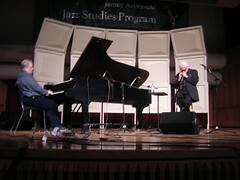 It was the finale of the school's "Jazz Week 2010". Jazz fan friends Zack, Kim, and Wayne made the trip with me. We arrived at the concert hall about an hour prior to the start time of the performance. In the back hall of the building, I saw Toots just outside the green room. He was heading to the stage for a sound check and short rehearsal. At age 87, he walked carefully and held the arm of his assistant as he made his way to the stage. I followed them in and decided to stay awhile, or at least until someone asked me to leave. Kenny was already sitting at the piano and playing a beautiful and lush ballad. Toots joined in playing with the most heartfelt and soulful sound one could imagine, and as the two jazz masters played, I marveled at the communication between the two as they prepared the concert. They were choosing the songs to be played, the keys they were going to play them in, and shaping a rough sketch of the form and interpretation of the tunes they were planning to use. No words were spoken, only eye contact, nodding, chuckling, winking, pointing, and the playing of song introductions, heads, and phrases on their instruments. They have played together many times before, so not a lot of time was needed. I stood about ten feet away from them and watched these masters work until they were satisfied that they were on the same page for the upcoming concert. It was an amazing twenty minutes. The concert was fabulous and an absolute treat for everyone in the audience. Lexington Herald Leader music critic Walter Tunis was sitting next to me and enjoying the concert as he scribbled in his notebook. Jazz educator Jamey Aebersold was intense as he operated his video camera. U of L saxophone professor Mike Tracy listened carefully to each musical line offered by the musicians. 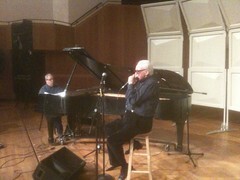 My jazz buddies, all sitting within twenty feet of the duo, were grinning and shaking their heads in amazement. They played many great tunes, including "Autumn Leaves", "Bluesette", "The Days of Wine and Roses", "The Dolphin", as well as a gorgeous and interesting medley of songs made popular by Frank Sinatra. Throughout the day, it was obvious that the two musicians enjoyed performing together. The standing ovations from the audience, both before and after the performance, made it obvious just how much everyone appreciated this treat.